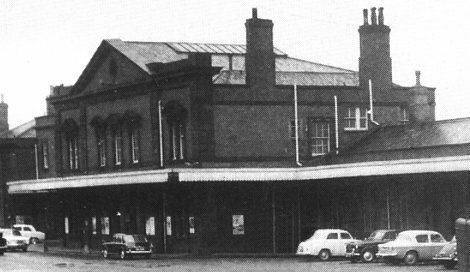 The station entrance in the 1960's. The station was built of blue bricks with stone decorations, and a large span overall iron roof. offices, waiting and refreshment rooms. prevented overcrowding and allowed both up and down trains to arrive on the same platform at the same time. 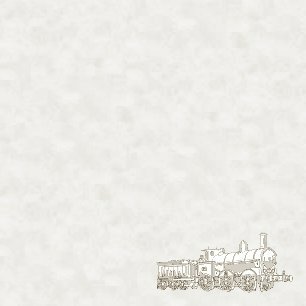 1st April 1869 Conversion of the broad gauge track to standard gauge. April 1899 The new carriage shed, sidings, and new signal boxes opened. 1911 Extensions to the south end of the Birmingham platform. until 20 years later at the High Level. July 1944 2 ton electric goods lifts were added. The end was in sight with the West Coast Mainline electrification scheme which included the Stour Valley Line and a new High Level station. It would be hard to imagine a similar amount of investment being made on the GWR mainline which to some extent duplicated the Stour Valley's route. The station as it was in 1856. From late 1963 to March 1967 the Low Level did see a large increase in traffic, but this was only while the electrification work was in progress, when many services were temporarily diverted. When the line reopened the GWR services were quickly reduced. The last Paddington to Birkenhead express ran in March 1967, and a year later the Shrewsbury services moved to the High Level. The station continued to be used by local DMU's until March 1972. In 1970 the station was converted to a Parcels Concentration Department at a cost of £30,000. Much of the trackwork was removed, the north signal box was demolished and the platforms were greatly modified. It opened on 6th April 1970 and was very successful, handling up to 8000 parcels each day. BR's policy on parcel handling soon changed, and it was closed on 1st June 1981. The building was listed as grade 2 on 25th March 1986. It remained as the British Rail Divisional Engineer's Department until it was purchased by the town council in May 1986. BR's staff left the building on 2nd May and on the 8th of the month a task force which was part of the MSC's sponsored Community Program, took over, and renovated the building's exterior. The building is now in use again, so hopefully its future is assured.